Make your case with medical records about pressure ulcers. Pressure ulcer staging and correct documentation are critical in acute care settings as well as long-term care settings. What the nurse assessed and documented is key to winning your client’s case. The Deep Tissue Injury pressure ulcer is one pressure ulcer type that can have a huge impact on your case because it tends to be incorrectly assessed, documented and/or treated. Deep Tissue Injury (DTI) pressure ulcers have been considered as an additional pressure ulcer stage by the National Pressure Ulcer Advisory Panel (NPUAP) since 2007, yet there is still much confusion related to this pressure ulcer type. 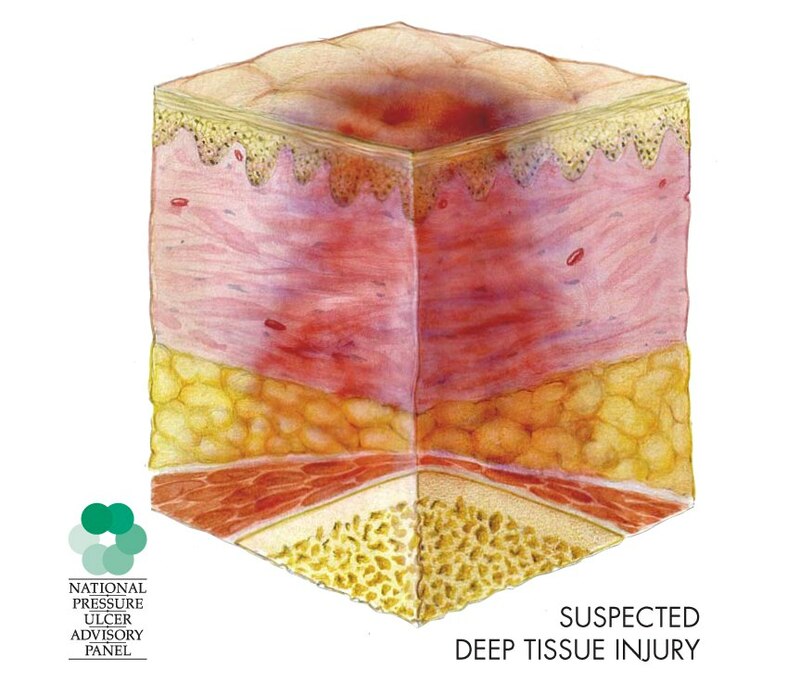 A deep tissue injury is a full-thickness pressure ulcer (injury down to deeper structures under the skin) although it initially appears as a superficial purple/maroon discoloration over a bony prominence or a blood-filled blister. Once the discoloration to the skin appears, the deep tissue damage has already been present for some time. It can be even more difficult to assess in darker-skinned clients. Early one morning Mary Older was in the basement laundry room in her apartment complex. The dryer fell off the top of the washing machine, hit her in the head and knocked her to the floor. No one entered the laundry room until the following afternoon, where Mary was found lying on the floor. At the hospital, the emergency department staff saw a purple area on her left hip and assumed it was a bruise from the fall. They did not document it was a “present on admission” area of skin breakdown, as required by Centers for Medicare and Medicaid Services. The area on Mary’s left hip rapidly progressed to a stage 3 pressure sore. While it was evolving this very serious pressure ulcer was incorrectly assessed as a superficial Stage 1 pressure ulcer. These two pressure ulcers, in reality, are at the opposite ends of the spectrum of severity. The sooner the deep tissue injury is properly assessed the sooner the correct treatment plan can be implemented. Mary’s attorney received the case because of the head injury, but then also studied the rapid progression of skin breakdown, and wondered if he had a nursing malpractice case as well. Though the initial treatment of offloading of pressure to the area is the same, the stage 1 pressure ulcer could heal from the superficial injury relatively quickly without any untoward events. The deep tissue injury evolves into a full thickness ulcer of a stage 3 or stage 4. Stage 3 and 4 pressure ulcers and the subsequent pain, suffering and complications are what clients sue about all the time. 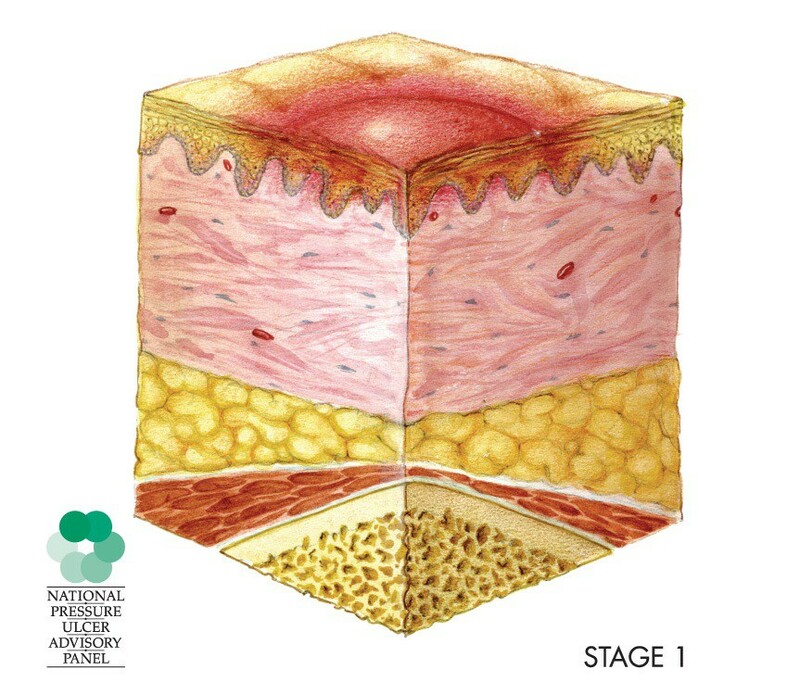 Focus in on the nursing notes that describe the tissues and not just the stage that was assigned to see if this pressure ulcer was properly assessed. Policies and procedures of the institution may only direct the staff to report stage 3 and 4 pressure ulcers to the physician and completion of an incident report. However, the deep tissue injury should be added to the policy as a reportable event. Lack of timely reporting can and does cause a delay in appropriate treatment. The wound can progress and complications mount and so do the litigation dollars. Focus in on the policies and procedures to see if they uphold your case or cause the case to derail. Focus on the handoff assessment between different levels of care. For example, a pressure ulcer may not be mentioned or mis-staged when a client is discharged from one level of care to another, such as from a hospital to a nursing home. If the institution meticulously assessed and correctly documented ALL bony prominences for pressure ulcers it could save them from a lawsuit. Any area of purple discoloration should be documented as a deep tissue injury upon admission. This absolves the institution of being culpable for the pressure damage that in actuality occurred prior to admission. As the deep tissue injury begins to open and deepen, the institution can look like the hero when properly treating a full-thickness pressure ulcer that had its beginnings before admission. The focus shifts from the institution to what happened prior to admission. Careful analysis of the medical record by a legal nurse consultant will determine when the deep tissue injury signs first appeared, and when the skin initially began to open and the ulcer worsened. Mary’s attorney chose to file the lawsuit related to the negligently mounted dryer and did not file a claim against the hospital for the stage 3 pressure sore that evolved from the deep tissue injury. Med League provides expert witnesses with expertise in evaluating pressure ulcer cases. Call us for assistance.